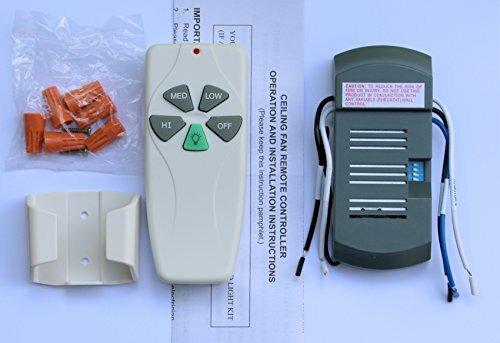 This is a BRAND NEW FCC and UL approved ceiling fan remote control and receiver kit. Made for Hampton Bay ceiling fans but will work on almost 95% of US fans. It will control the light and fan functions i.e. High/Medium/Low fan speed and increase/decrease regular lightbulbs. This will work on fans with regular light bulbs ONLY(incandescent) and not fluorescent bulbs or CFL (compact fluorescent) or LED bulbs. 9V battery is not included. Lifetime FREE technical support. If you have any questions about this product by Lightingindoors, contact us by completing and submitting the form below. If you are looking for a specif part number, please include it with your message.